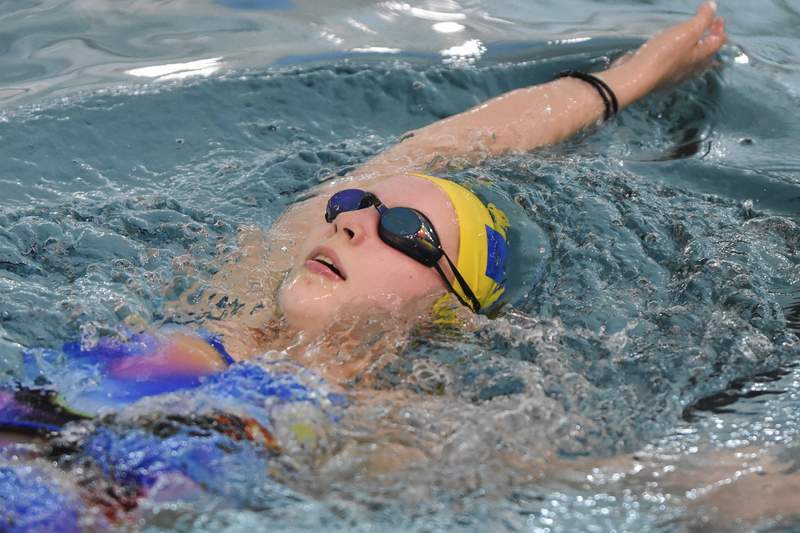 Mike Moore | The Journal Gazette Homestead swimmer Maggie Stock, shown practicing recently at Summit Middle School, ranks third in the state in the 100 freestyle. Homestead: The Spartans are the highest-ranked area team in the state as they defend the sectional title at South Side. Carroll: The Chargers may have the best hope for an individual state champion, but first they will attempt to surpass Homestead, which has been an issue recently. 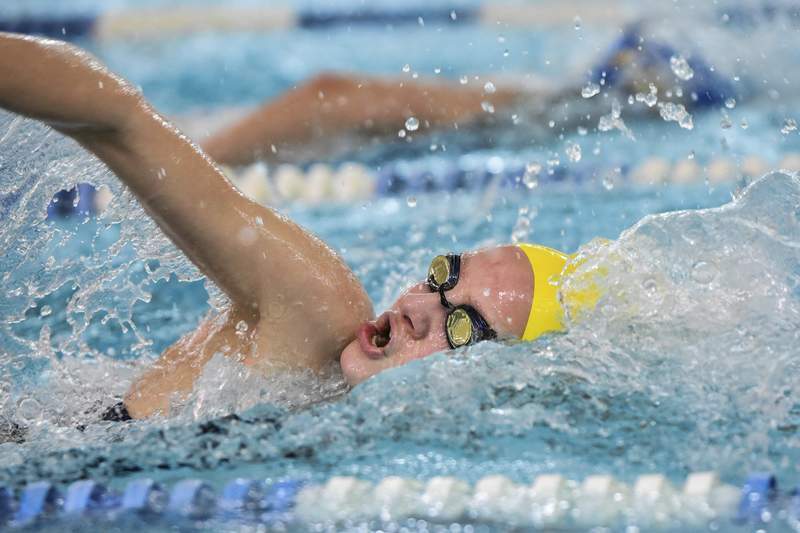 Bishop Dwenger: Fresh off a SAC title, the Saints are swimming well but need to up their game in a sectional that adds in Homestead and Carroll to the board of conference teams. Jackie Brenn, Homestead: A contender for the state diving title, Brenn will be defending her sectional and regional titles. Mallory Jackson, Carroll: She remains on the cusp of an individual state title and will be out to prove she is still top dog in the sectional. She was a winner of four sectional events in 2018. 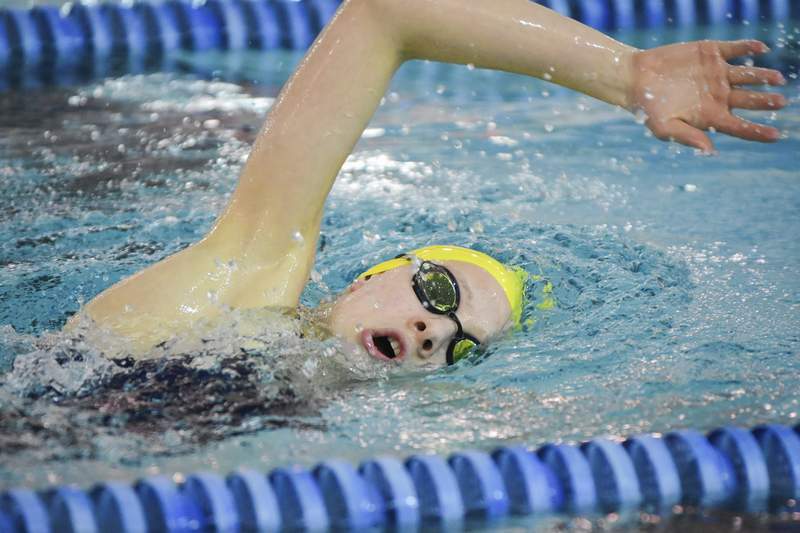 Laura Wright, Bishop Dwenger: She won two events in the SAC finals and will be considered a threat in both in the postseason, most notably the 100 breaststroke, where she ranks seventh in the state. Katie McCay, Concordia: This freshman has put the city on notice and won four events at the SAC swimming championships, two as an individual and two as the anchor to relay teams. It is never too cold outside to go swimming. That's Homestead swim coach Justin Max's message as the Spartans girls prepare to defend their sectional title this week. They will have to wait at least another day, however, as the sectionals will now begin Friday at South Side's Helen P. Brown Natatorium due to the weather. Swimming finals and consolations and all diving events will be Saturday. The Spartans lost a tri-meet against Zionsville and state power Carmel because of bad weather, though the divers were able to compete that day. They also lost a dual meet with North Central. Homestead doesn't have a ton of meets on its schedule as it likes to limit meet time to maximize its training for the postseason. The Indiana High School Swim Coaches Association ranks Homestead senior Jackie Brenn as the second-best diver behind freshman Daryn Wright of Plainfield. Brenn placed second in the 1-meter diving event last year and won the event in 2016. Homestead girls swimming has had no other individual state titles since 2011. “It is a luxury that not a lot of swim coaches get to have to be that confident that one of your athletes is going to take home that event every meet that you go to,” Max said. Brenn also won the regional title in 1-meter diving last season while Mallory Walker, a fellow senior, placed third. Homestead was the top area finisher at the state finals last year, placing ninth. The Spartans dominated on their way to a sectional crown that they will defend this week against all eight SAC schools as well as Carroll and Canterbury. Last year, the Spartans finished with 525 points at sectionals, edging Carroll by 10 points. The next highest-scoring team was Concordia at 274. Max knows the rivalry with Carroll only grows stronger. The Spartans' 10-point win margin in the sectional round was narrowed to eight during the state finals. In 2018's sectional, there was just one event of the 12 that saw a swimmer from anywhere other than Homestead or Carroll place in the top two. The Spartans head into today's sectional with three high-ranking individuals and relay teams. Besides Brenn, sophomore Maggie Stock is third in the 100 freestyle, and sophomore Audrey Crowel is seventh in the 100 fly and eighth in the 200 free. All three won those events during last season's sectional meet. Homestead's relay teams in the 400 free (sixth), 200 free (third) and the 200 medley (second) are also ranked by the IHSSCA. Homestead will also lean on sophomore Lily Kaiser, who was a sectional champion and a state qualifier a year ago. Max said he has also been impressed with senior Shelby Crist, who has come on strong after starting swimming at a club level just a year ago. Max feels that the Spartans also added a strong freshman class in Kyra Tonsil and Halle Weaver.